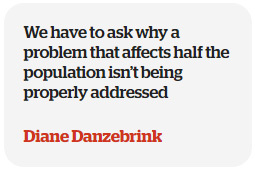 Di Danzebrink this week relived the horror moment where she contemplated suicide by driving her car into oncoming traffic in an interview in the “i” newspaper. Talking to journalist Claudia Tanner, Di spoke about the way she felt after surgery brought on early menopause, and went from being a woman too nervous to leave the house to the confident menopause campaigner she is today. While hot flushes and night sweats are common side-effects of the menopause, the impact on women’s mental health is often not fully recognised. It’s all a natural part of ageing – for some. Others are catapulted into it early after surgery or medical treatment. Di found that the very sudden and abrupt change in her hormones left her “unable to function” or work for months after she had a hysterectomy at 45. And she’s not alone. One in four women experience debilitating menopause symptoms that can last up to 15 years, according to research. 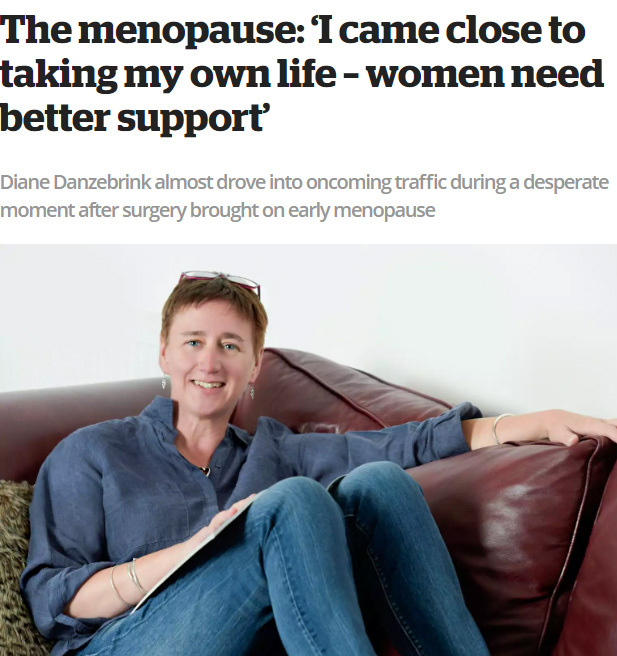 Read Di’s interview online here – and if you have not yet signed our petition #MakeMenopauseMatter, please do so now. Around 4,000 people have signed so far since it was launched a week ago.